A busy day... Up early, Sharon and I had breakfast at the hotel. Afterwards, we caught a cab to Holy Trinity Church in Georgetown. Getting there a little after 9:00 am for a 9:30 am Mass, the place was already packed. Sharon made a quick decision to head up into the choir loft. We were able to grab seats in the last row of the loft! Given the number of people milling around over the next 30 minutes, I felt very lucky to have gotten some seats. At one point, the priest asked people to move together to make room for the hundreds of people in the back!?! Jack wandered over from his dorm and joined us. It was a nice service; I enjoyed the homily. After Mass, we walked to Jack's dorm room. He changed clothes and then we caught an Uber back to the hotel. The plan for the afternoon was to go to the Nationals versus Phillies MLB game. We walked to the Foggy Bottom/GWU Metro station and took the Metro to the game. We had some very nice seats down the third baseline. Although it was a good crowd, the area right around us was empty, including the whole row we were in [Section 114, Row U, Seats 1, 2 and 3]. With temperatures in the high 80s, we were in the shade after about the fifth inning. [Note to self], you need to be higher up on the third base side in order to be in the shade in the afternoon. Jack was very motivated to get a foul ball. He had one very good chance; a ball bounced on the seat right in front of him as it went for it. He was not empty with his effort. 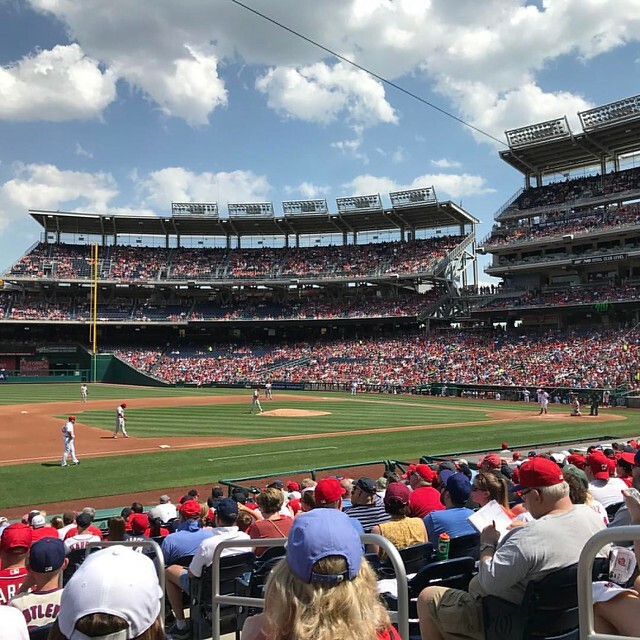 Harper hit a two-run homer in the third inning and a game-ending, three-run drive with two outs in the ninth, leading the Washington Nationals over the Philadelphia Phillies 6-4 on Sunday. After the game, we caught the Metro back to the hotel. Getting cleaned up, we headed to an early dinner at the Blue Duck Tavern. The Blue Duck Tavern was awarded a Michelin Star in 2016 is continuously listed as one of top restaurants in Washington, DC by the Washington Post, Washingtonian and Zagat. Sharon and Jack ate there last August and Sharon and I had a dinner there last October. With a very early start on Monday morning, we put Jack in an Uber and sent him back to his dorms after dinner.